Trumpet mutes are handheld attachments used to alter the trumpet sound. They’re capable of softening, warming, reducing, or altering the instrument’s tone to produce the specific, desired sound. Although most any solid object can be used to mute a brass instrument, the most common trumpet mutes used by working players are straight, cup, harmon, bucket, plunger, and practice. Standard trumpet mutes are either inserted into the bell and held in place by friction, like the straight, cup, or harmon mutes, or attached to the outer bell by clips, like some bucket mutes. The plunger mute, as an exception, stays in the player’s left hand and must be precisely held in place over a specific portion of the bell to produce the desired tone. 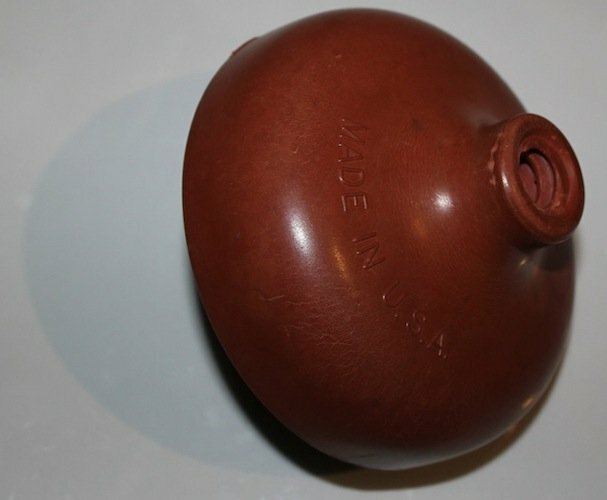 Early trumpet mutes were constructed from fiber materials and polyurethane. As the Industrial Age progressed and manufacturing techniques improved, straight mutes were soon being made by processes that included metal spinning, injection molding, woodworking, and casting. By the 1960’s, mute manufacturers used aluminum, wood, brass, copper, ABS, polystyrene, carbon fiber, and fiberglass. 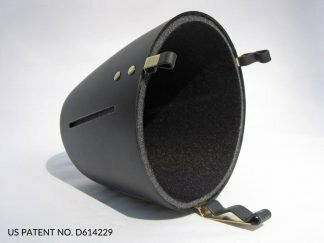 Today, the finest mutes are generally made of specially-engineered fibers or independently-spun aluminum halves joined together. The metal mutes that join together are usually mechanically joined forming a “crimp” connection. The Soulo Mute Company designed the first, break through “crimp-less” connection, joining the two halves in a way that allows the air to flow freely on the inside, as well as on the outside. Most inserted trumpet mutes utilize a solid strip or small segments of cork to retain the mute inside the bell. To reduce falling, some brands require the musician to file and individually shape their mute’s cork segments to better match the bell’s interior surface angle. The issue with using cork is that over time it deteriorates and dries out, leading to the inevitable mute fall outs. Modern mute makers like SouloMute use an advanced combination of shaped cork and neoprene to “lock” the mutes in place. This prevents musicians from experiencing the inconvenience and embarrassment of losing their mutes during a performance, as well as protecting their investment. Over time, damage from falling can potentially alter the tone your mute produces. Straight trumpet mutes are among the most common mutes found in an accomplished trumpet player’s case or gig bag. Although mostly used in classical music, straight mutes were common in early jazz before other mute designs became more prevalent. While still made from a variety of materials and processes, most straight mutes are comprised of either metal, fiber, wood, and plastic. Metal straight mutes generally have a more desirable, bright and piercing sound while those made from fiber, wood, and plastic counterparts produce an slightly softer and perhaps even duller sound. Straight mutes are inserted into the trumpet’s bell and held in place by three “spacers,” which are generally made of cork and evenly distributed around the circumference of the mute’s upper, exterior surface. These spacers allow airflow around the outside of the mute and reduce the back-pressure players experience. Before they can be dependably used, most mutes first require the musician to breathe into the bell to create condensation on the bell’s interior surface, which helps to keep the mute in place. Before Soulo Mute’s break through invention, all spun-metal trumpet mutes were made with a standard crimp connection, by joining the top and bottom parts together, which introduces several problems to the mute’s performance. By adding the extra metal necessary for the unsightly, bulging crimp, the manufacturer creates an unpredictable, imprecise airflow obstruction inside the mute. This means each trumpet straight mute produced by the same manufacturer can have slight tonal deviations and may not produce the exact sound professional musicians intended to purchase. Additionally, the interior obstruction demands the player provide increased airflow and exert more effort while using the mute. The patented design of Soulo Straight Mute for trumpet features an independently-spun aluminum top and bottom, which are joined on a metal lathe with a secure, “crimp-free” connection. In addition to allowing great projection and no resistance, this unique process also eliminates the weight of the metal, needed for the formation of the crimp, and thus creates the lightest straight mute on the market. It is the only mute with perfect hemispherical bottom, which allows the air to flow in and not hit any flat spots, therefore creating perfect intonation and low to no resistance. Cup mutes are another common type of trumpet mute. 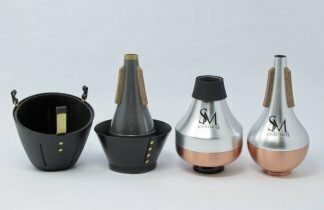 While they look like a straight mute with an additional bowl, or “cup”, at the end, these mutes produce a more distinct, fun, and mellow sound. Like straight trumpet mutes, cup mutes are inserted into the instrument’s bell and held in place by three, evenly-spaced corks around the circumference of the upper portion of the mute. Although more commonly used in jazz, cup mutes can be heard in classical music, as well. The first cup mutes, created by Humes & Berg, were made of fiber material. These initial mutes sounded great, but offered significant resistance and altered the pitch significantly. Very few modern cup mutes are still made of fiber material, mainly because most manufacturers can not figure out the fiber material formula, that gives this specific tone of a traditional cup mute. Instead they manufacture them using aluminum, wood, ABS, polystyrene, carbon fiber, and fiberglass. Most professional musicians find that metal and plastic cup mutes cannot produce the authentic “cup” sound when compared to the traditional Humes & Berg and Ray Robinson models. The sound of the cup mute was changed to a more metallic and bright, as in the case of the metal mutes, or more dull as in the case of ABS and Polystyrene mutes. With the introduction of new materials, manufacturers were able to improve on the functionality of the cup mute, thus making it “adjustable”. This important feature helped the trumpet player in two ways. One, the same mute could now be used on several horns with different bell sizes and still made to sound the same (adjust the cup portion to the bell at the exactly same distance, which was not possible with the old mutes, which are not adjustable). And two, with an adjustable cup mute, a trumpeter can now perform different color sounds from the same mute, just by adjusting the bottom closer or further away from the bell. 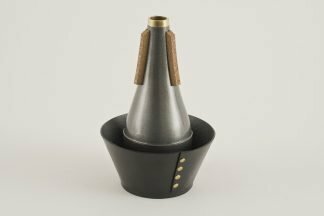 The Soulo Cup Mute was designed to bridge the gap between the old and the modern cup mutes by keeping the authentic sound of the fiber mutes, while improving the pitch dramatically and providing the clearly desirable adjustable setting. Once removed entirely, the Soulo Mute Cup Mute can also double as a mellow sounding, lyric straight mute. Popularized by iconic trumpet players like Miles Davis, Harmon-style mutes are used almost exclusively in jazz performances. Also referred to as “wah-wah” or “wow-wow” mutes because of the sound they produce, trumpet harmon mutes fit inside the bell and completely divert all airflow into the mute. 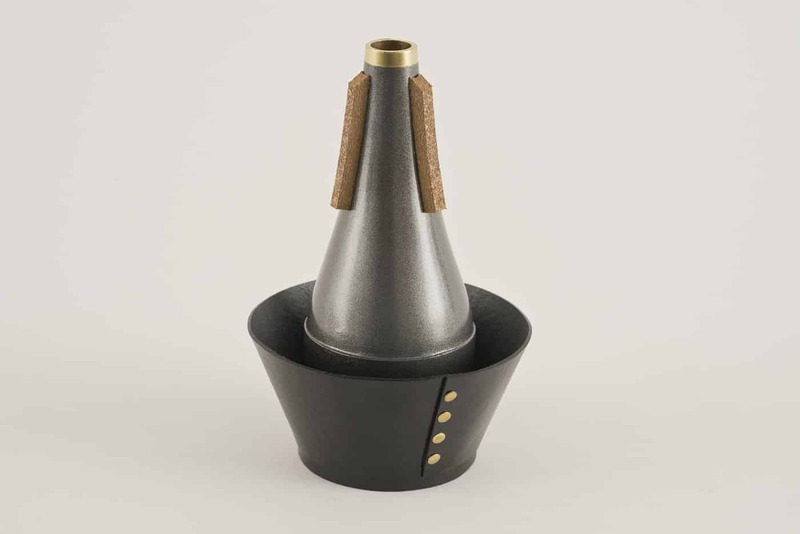 Unlike straight and cup mutes, which allow some airflow around the mute’s upper cone, a wide strip of cork generally encircles the top of a harmon mute and creates an airtight seal with the interior bell. This does, of course, create noticeable resistance and requires more significant effort from the musician while performing with it. Traditional harmon mutes suffer from several significant design and performance problems. Due to their weight and insufficient insertion engineering, you’ll find most harmon trumpet mutes with a number of small dents from striking the floor during performances and auditions. Their complete airflow diversion generally makes them hard to play for extended sections or pieces, and their pitch is significantly inconsistent, especially in the lower register. In addition there are many harmon mute manufacturers, although the name comes from the Harmon Mute Company, and this large number o manufacturers has designed a number of competing designs and shapes, like “straight” harmon and a “bubble”, making for a big difference in the sound. After multiple requests from trumpet players desperately seeking the “great sounding, excellent intonation, easy to play, stay in the bell combination”, SouloMute set out to remedy all the failings of typical harmon mutes before releasing its version in May 2018. 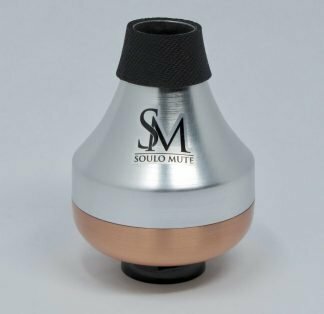 Like the revolutionary construction of their other trumpet mute designs, Soulo Mute created a harmon-style mute with a perfect, interior hemisphere that plays much more easily and dramatically improves the lower register pitch. The patented “cimpless” connection also contributed to the vastly improved intonation and free-blowing experience. Instead of the inferior, traditional cork, its design includes a soft, high-friction foam that won’t damage the bell’s interior finish and will stay in place. 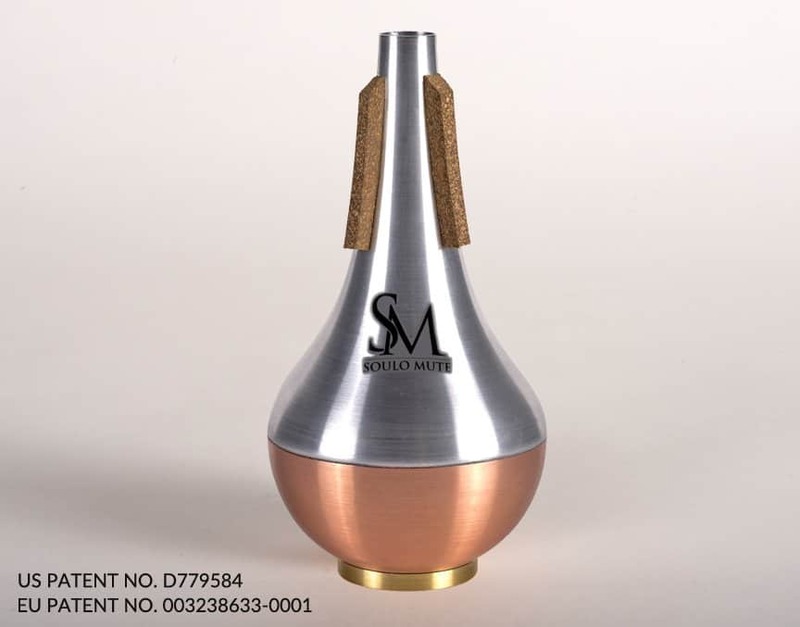 By carefully updating the design and manufacturing of their harmon-style trumpet mute, Soulo Mute has preserved the traditional Miles Davis sound while eliminating the shortcomings of the original product. Trumpet Bucket mutes offer a muffled, unaltered sound somewhat like playing with the bell very close to a music stand. Because of the reduced volume, working musicians often prefer these mutes while playing smaller or more serene venues. Usually clips secure the bucket mute to the outside of the trumpet’s bell and offer a free-blowing experience. Because the mute doesn’t insert into the bell, very little backpressure or resistance is created. For this reason, bucket mutes can be comfortably used for the duration of a performance or gig. The typical issues associate with this type of mutes are as follows: They are harder to attach, as opposed to the mutes that go inside the bell of a trumpet, which makes them undesirable for “fast mute changes” during a performance and they are usually top heavy. The Soulo Bucket Mute was designed with these issues in mind. It has flexible, adjustable brass clips that are coated to protect the bell’s surface and adjust to accommodate different bell sizes. The mute requires the player to size it up once they acquire it and after that it is very easy to put on and off. Its patented shape and adjustability also allows the user to modify the mute’s distance from the bell, which offers two different sounds. Professional trumpet players use this specific feature to more precisely blend with the rest of their section, all of whom may be using mutes of different brands and construction. The Soulo Bucket is also the lightest bucket mute available. At nearly half the weight of its competitors, this bucket mute will be the most comfortable during extended sets. 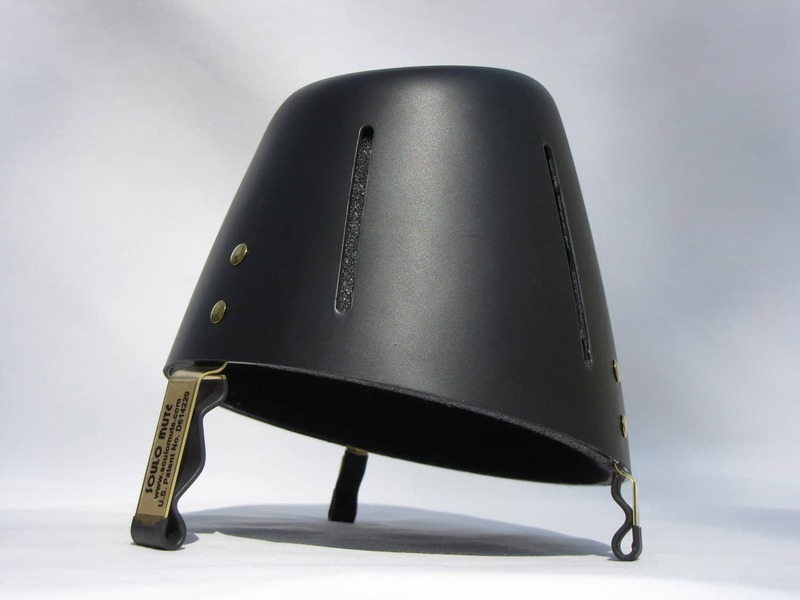 Many professional players report using Soulo Bucket as a practice mute, by stuffing additional cloth inside the mute and thus “muting” the sound even more, while preserving the free-blowing experience and protect their chops. Plunger trumpet mutes are exactly as the name describes, a toilet plunger. It is typically held in place by hand and requires the musician to regulate the amount of distance from it to the bell. Soulo Mute does not offer a plunger mute for trumpet, since they can be easily obtained from any hardware store. Trumpet practice mutes are non-performance mutes that are typically used whenever a musician must discretely play or warm-up without disturbing others, such as in a hotel, apartment building, or back-stage prior to a performance. Because they muffle the vast majority of the sound produced, practice trumpet mutes create high-resistance to the musician’s airflow and are not necessarily comfortable for long, continuous practice sessions. Although only softening the trumpet sound, many players report using Soulo Bucket mute as a practice mute, because of it softer sound and free-blowing ability.